I was recently reviewing a handful of old posts on the blog, including a number of my episode blog posts on Hyouka, a project I’m still inclined to call my finest aniblogging work to date. 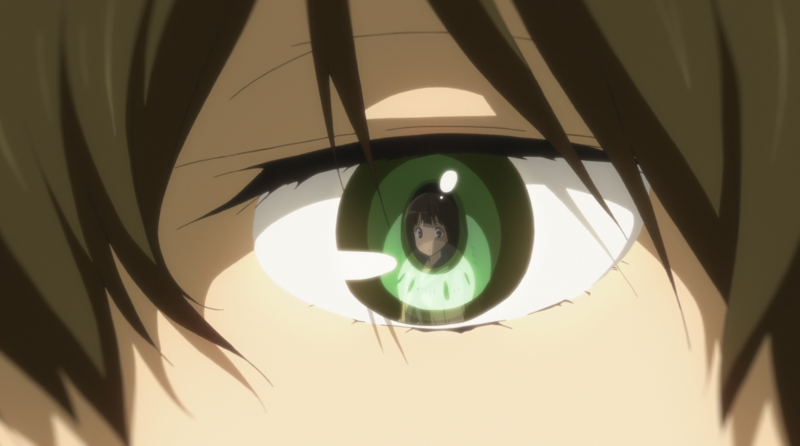 As I did so, looking over the depth of meaning I was able to extract from the show’s visuals, a question occurred to me: “What makes Hyouka‘s cinematography so good?” Obviously, it’s possible to point out specific instances of well-executed shot framing, storyboarding, editing, and so forth, but my question was of a different, more comprehensive nature. Yes, I was asking myself to put together an all-encompassing theory regarding the merits of Hyouka as a cinematographic work. What a fool I was. But having asked the question, an answer was required. There are two parts to this answer, and the first leads into the second. This is that Hyouka, despite its dalliances with fantastical visuals, is fundamentally a show about the mundane. There are no giant robots backlit by planets; there are no stunning vistas. The materials of its execution are the stuff of non-legend. 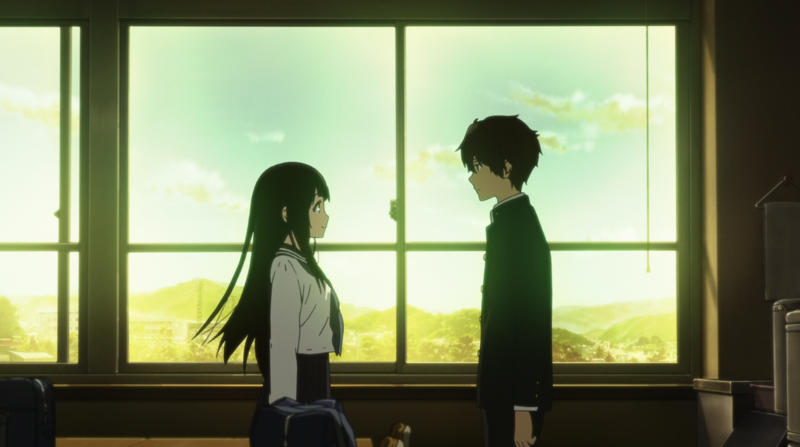 Classrooms, schools, restaurants, occasionally the countryside or a festival… Hyouka resides in the ofttimes bitterly plain world of Oreki’s gray-to-rose-colored life. This is relevant insofar as it makes Hyouka‘s visual creativity and excellence especially impressive. The visual language of Hyouka is constructed of necessarily (by setting and, even, by theme) basic components. Its success, therefore, speaks volumes of its staff’s understanding of both the materials and, critically, the world they have been given to work with. That final bit leads into the second part of the answer – the Hyouka as a show, visually conveys a deep familiarity with, understanding of, and immersion into its world. That is, Hyouka as a work of cinema achieves what is a virtually complete articulation of its thematic and emotional concerns by way of cinematographic manipulation of its world. A common phrase going around anime criticism these days is that the world of a show feels “lived-in,” which is typically used to describe background art or other mise-en-scène design elements. This is, of course, a fine thing to do, but I would argue that Hyouka takes the next step beyond this. Hyouka‘s world is not one that feels “lived-in.” It is one that the audience truly lives in. The conceptualization of Hyouka‘s individual scenes not only as things in which the characters move, speak, and act, but also as entire worlds unto themselves sets the anime apart from others. You need only watch the way the camera flits about from angle to angle, the way the lighting shifts, the way shot composition is used, to understand that what director Yasuhiro Takemoto and the rest of his team at Kyoto Animation have done is create a physical, emotional, and thematic world through visual language. 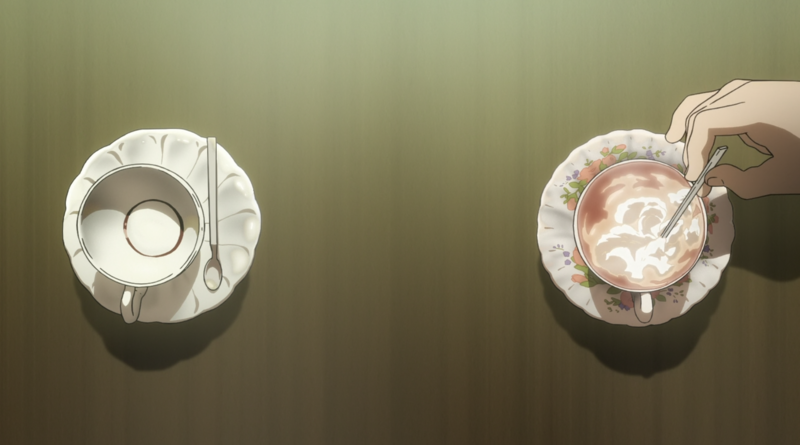 It was Oreki’s two confrontations with Irisu in the tea room that really got me thinking about this, and I think it serves as a useful example of what this means in technical terms. Those scenes are particularly interesting in construction because they occur in a room that is very like a stage in physical construction. It is a natural frame within a frame, a screen within a screen. 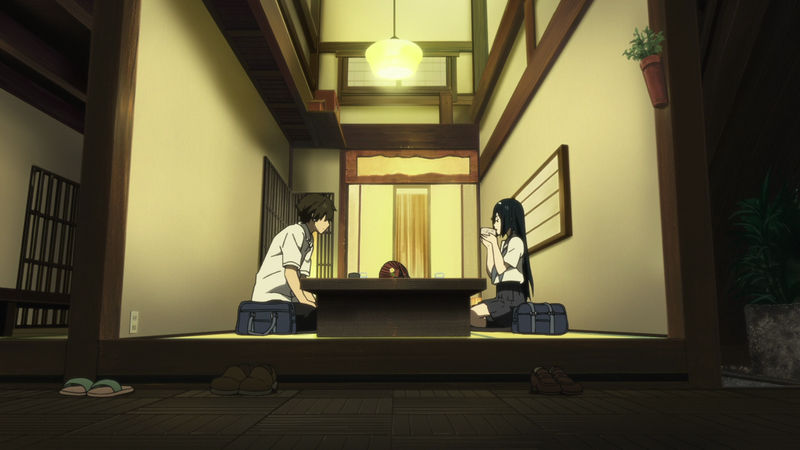 By the roving camera in both scenes, along with the ever-shifting lighting, conceives of the room not as a place in which two anime characters are having a conversation, but a three-dimensional space, a space that is “lived in” because it has depth and dimension and is tangibly, almost tactilely inhabited by characters who have bodies and exist within the space itself. These scenes might serve as a microcosm of Hyouka as a whole, which very well might have been yet another anime in which anime characters do anime things. And nothing would have been wrong with that, just as there is nothing inherently wrong with other anime in which the characters play across the surfaces of their worlds. But anime is anime, and as anime, you can put the “camera” wherever you wish. There is a freedom in that, that might be either unreal or viscerally, oppressively real. Hyouka, because of its cinematographic virtuosity, I think is the latter. You haven’t answered the question, though! What makes Hyouka’s cinematography so good? I have, I see now, unintentionally saved my thesis for last: Hyouka‘s cinematography is so good because it is expressive, to the fullest extent, of the show’s world, characters, themes, and everything else. The visual language of Hyouka, and you will have to either trust me on this or read all 22 of my analyses on the individual episodes, speaks as clearly as the show’s script – and, at times, even more so. And it does this, remarkably, frighteningly, with utmost consistency through nearly 10 hours of runtime. That it does so with materials as mundane as its setting makes this more impressive, somehow, but in the end the ultimate point is how much meaning inhabits the cinematography of the show. It is fantastic. It is rich. It may very well be the best-directed TV anime of all time… but I haven’t seen enough anime yet to make that claim for real. Back then I didn’t look too deeply (or at all, really) into the visual language of the show to try and figure what it trying to say or do with the characters or the scene but regardless the intentions of the shot and the feelings of the characters came through to me. And evidently this happened with Dawnstorm and I’m sure everyone else that’s watched the show. Yeah, the true mark of its success isn’t that people like me can really dig into all of the details, but the fact that those details actually work whether you’re conscious of them or not. A lot of my favorite anime directors (like Rie Matsumoto) have really ostentatious styles that call a lot of attention to themselves, but there’s something about the delicacy and subtly of Hyouka‘s visual language that makes it really quite something to watch. And yes on the production strength for sure; you’d never get this kind of finesse from a project that was being rushed like so many TV anime these days are. Yup! My thoughts exactly. I think you mentioned this before in your posts, but that’s the hard thing about analysing Hyouka: other works are often more “explicit” about their scene setups and cinematography choices, so you notice when they’re trying do to something artistically relevant. Hyouka’s excellence in story-boarding and visual language is so pervasive, consistent and subtle that it can be hard to actively notice – though their effects are certainly felt regardless. Hyouka is great, but not “cult” – you don’t have to be a guy with a monocle, tea and reclining chair to experience its excellence; though you may need to be that guy if you want to explain why it works so well. In digital interface design, there’s a saying that “good interfaces are the ones that you don’t even notice are there; and would have trouble explaining why they’re actually good”. Every time an interface makes you think about how great it is, it’s actually failing – since it’s drawing attention to itself instead of just working to facilitate interaction. I believe this is true for all forms of communication; and in this regard, Hyouka is one of the most efficient pieces of communication ever produced. Hyouka draws no attention to its myriad technical and artistic achievements; you don’t even notice they’re there unless you’re making an effort to do so. 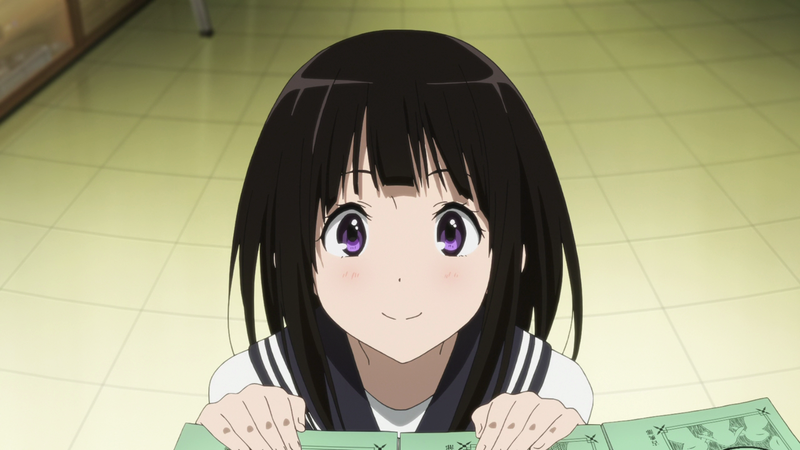 That said… long rant about my experience with Hyouka and your blog incoming. Hyouka left a strong impression with me since its release, and I’ve enjoyed it greatly. But as years passed and I compared it with more recent series, my appreciation of it grew more and more, along with a feeling that there was a lot of depth and technical excellence that I missed in my first experience with it. A few months ago, I finally sat down to re-watch it. After watching the first two episodes, I was in love all over again; but still feeling that there was a lot I was missing. I’ve read reviews and episodic posts about it – all of them a bit superficial – and eventually, I found this site. And boy, oh boy. I’m very sure your Hyouka series is your “finest aniblogging work to date” because it’s one of the best aniblogging works anyone has ever done. And not just as a piece of aniblogging; it’s likely one of the best critical appraisals I’ve had the pleasure of reading. Watching Hyouka along with your posts was a blast, and you helped me re-discover what is now one of my most beloved pieces of media. Perhaps even more importantly, you also helped me learn a lot about cinematography, and inspired me to develop a more attentive eye for it. After I finished the series a few weeks ago, I wrote down a long comment thanking you for the amazing experience, but ended up never posting it because it sounded too dramatic and long-winded. This post presented an opportunity for me to reconsider and say ‘screw that, this human being must be thanked’. So really, thank you very, very much for your work. This little corner of the internet you’ve created is certainly appreciated. Do be proud – even smug, perhaps – about it! W-wow, thank you very much for this comment. I think you still might be being a little dramatic but also I am very bad at accepting compliments so instead I will just say thank you once again, this comment made my night. I put a lot of myself into my Hyouka project and really loved what I was doing, so it means a TON to know that other people have appreciated it and found greater joy in the show because of my work. That’s really what my goal is in writing this blog – to help people appreciate and love things more, so knowing I’ve been able to do that for you with this show is very special to me. I like your comparison to digital interfaces. In the case of art I don’t always think it’s the case that invisibility of the form is the prime value (some films/anime achieve the astounding effect of making themselves about their cinematography without being completely smug about it), but it certainly is one that requires an incredible amount of care and technical competence. Ego, Hyouka may indeed be the best-directed TV anime ever. Revisiting those Hyouka posts? Those were awesome. You really helped someone like me, with little know-how nor a detailed eye but plenty of pet-thoeries, to get a handle on the visual language of the show. The very centre of each screenshot, at the very least, is never host to the most important thing on the picture. The question, though, is if this isn’t just the very basics of cinematography, and every show does that to some extent. As I said, I don’t have the know-how and lots of “clever” theories. It’s good to remember those those posts, and it’s good to remind people of them. Anime is a visual medium, and those posts do a very, very, very good job at showing how that’s possible. And I certainly remember your comments on a lot of those posts! Good times.